يحظى فندق Tall Trees Canberra بمكان متميز في محور المدينة والاستمتاع بـ مطاعم, سياحة, ثقافة في هذه المنطقة الفاتنة. يقع مركز المدينة على بعد 5 km فقط. ويمكن الوصول إلى المطار خلال 15 دقيقة. كما يمكن الوصول بسهولة إلى عدة معالم سياحية قريبة. إن الخدمات التي يقدمها Tall Trees Canberra تضمن للنزلاء إقامة مريحة. يقدم هذا الفندق العديد من الخدمات الكفيلة بإرضاء أكثر الضيوف تطلباً. تعكس غرف الفندق البالغ عددها 78 المنتشرة في 2 طوابق جواً من الدفء والألفة.خدمات عصرية مثل تلفزيون بشاشة مسطحة, اتصال لاسلكي بشبكة الإنترنت (مجاني), غرف لغير المدخنين, مكيف هواء, تدفئة موجودة في بعض الغرف المختارة. كما أن مجموعة الخدمات الواسعة الموجودة في الفندق لضمان راحتك تترك لك الكثير من الخيارات لقضاء وقتك أثناء فترة إقامتك. إن كنت تتطلع إلى إقامة مريحة وهادئة في المدينة، فستجد في Tall Trees Canberra بيتك الثاني. يُرجى العلم بأن معاملات دفع المصروفات العارضة باستخدام بطاقات الائتمان في الفندق تقتضي خصم رسم إضافي من بطاقة الائتمان بقيمة 1.65%. This hotel displays photos of it's new wing, but then gives you a room in the old 'annexe' wing. That's actually illegal. The office of the ACCC is probably just down the road - I doubt any of their staff stay here! location was really quiet, if you're looking for a quiet place to sleep, this is it. no restaurants within walking distance, but there are many if you drive about 3 minutes. the best thing about the hotel is the service, they always smile and really helpful. hot breakfast was really nice. the only con is the room was small, but they do provide ipod dock. Excellent cleaners very friendly. Nice modern spacious room and bathroom. This motel is about to be taken over by Ibis Styles just hope they maintain the quality and good value for money. Need a car - about 5 mins drive from Civic centre. A clean comfortable and inexpensive hotel. Great location for my purposes but well away from the city and attractions. Ainslie shops is a five minute walk and Dickson is a 5 minute drive. Pretty much a good old fashion motel type of accommodation. The room was very neat and comfortable, we have 3 children and they loved there stay. Breakfast was complimentary however would have liked more variety. The staff were so nice, overall we had a ball. Very quiet location too. The family room that we rented is clean with comfortable beds and with wifi access. The Motel is close to local shops and restaurants (5 mins drive), and it was easy access to the city. Check-in and check-out was easy. Quite a nice stay. Previous guests had wrecked the freezer with frozen coke and staff were very conscientous about cleaning it up. Bathroom a bit on the compact side, but adequate. Reception staff were excellent. We had a comfortable stay. Well located - easy to find. Friendly and helpful staff, especially Belinda in the restaurant. Disappointed no real cooking facilities in room (microwave upon request). As we were there in a heat wave, a pool would have been very welcome. Would stay there again. My stay was very nice and comfortable, the room was quiet and well maintained. The cleaning staff and those responsible for the mini/bar were however inconsistent with their restocking and I was frequently left without milk/cream for the complimentary coffee service promised by the hotel. Our stay was good. Checkin in and checkin out was easy. The staf was helpful and nice. The bathroom was clean. The room was modern. It has a warm feature and color coordination inside the room that makes you feel at home. I would recommend this place to my family and friends. I will definitely come back and stay at this place. Family room was comfortable and as expected from imaged. The diner staff were pleasantly friendly. The chef was amazing, gorgeous food and catered for difficult dietary requirements. It was a lovely stay. The family room was well fitted and comfortable for three adults. The food is highly recommended - warm and soothing like a home cooked meal. The only staff on hand on arrival was quite busy but apologised for the delay. At first we couldn't figure out how to turn on the heating as it seemed by all signs to be 'on'. The staff were quite helpful though in pointing out an extra switch near the main bed that supplies the power to the system. A typical motel, decently executed. Meets expectations. Rooms were clean. However, as most (all?) rooms face the parking lot, some noise in the morning is practically unavoidable as people pack up and leave. 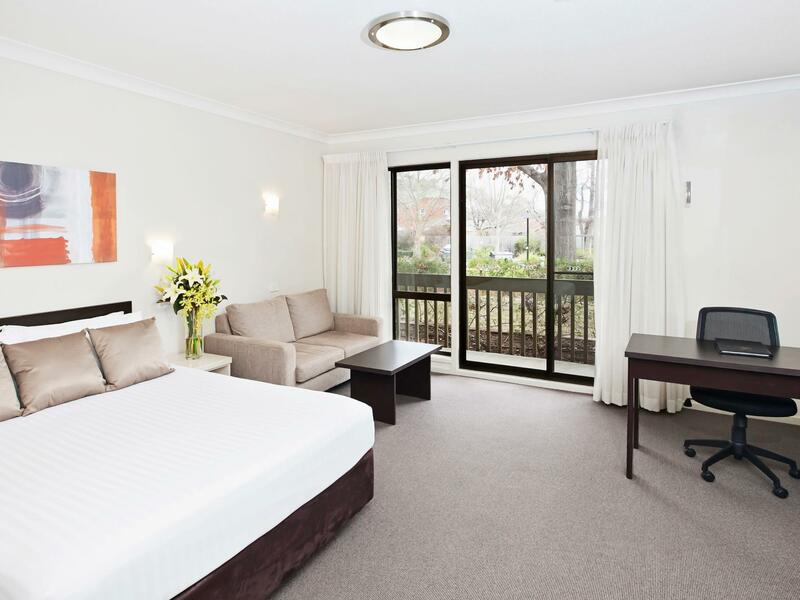 Stayed here as a base to see all the attractions Canberra has to offer, great location, so close and easy to find. Staff helpful, place clean, great tv channel slection if weather is bad. Had an awesome time. All new, no hassles, happy staff, clean and comfortable. staff was excellent, couldn't fault this accommodation I booked last minute. check in was easy . check out was easy with accommodating late checkout request. Noisey guests in the rooms next to us and above us. Loudly Talking on cell phones prior to 7am. Suspicious character wandering through private guests parking area.